Ekiti State Governor, Chief Ayodele Fayose, has inaugurated 16 newly-elected local government chairmen with a charge to them not to distance themselves from their people, even as he blamed the FG for turning yuletide to a period of gloom. According to a press statement by the Governor’s Chief Press Secretary , Mr Idowu Adelusi in Ado Ekiti on Sunday, the governor who inaugurated the newly elected chairmen at the Government House, also announced the immediate appointment of 13 immediate past local government chairmen that were not returned for another term as Special Adviser to the Governor in their respective local government areas. “Remember that the way up is the way down. If you don’t have the money make yourself available to the people. The people are not asking for much but a shoulder to lean on. We are a small state and if we stay together we will make a great difference. ” This is not a period to stay aloof from the people you are leading. The people are facing a lot of challenges and we must make every effort to ameliorate their suffering. I pray that we will move into a new year of abundance, victory and accomplishment, ” he said. On the current economic situation in the country, Fayose blamed the Federal Government for turning the yuletide period to a period of gloom with the fuel scarcity and poor finances of the people. “They don’t have the clue to problems facing the country. We will sell petrol to people at pump price of N145 per litre and we are pumping out petrol that we have in government dump to do that. We are going to locate a filling station to use for the sale on Christmas day in Ado-Ekiti, ” he said. Fayose also said he understood the mentality of the All Progressives Congress-led Federal Government and that Nigerians would not welcome the release of any Chibok girls at this point in time. Fayose said he would always try his best to ameliorate the suffering of the people of the state and wished he had more resources to do more peoples oriented programmes. 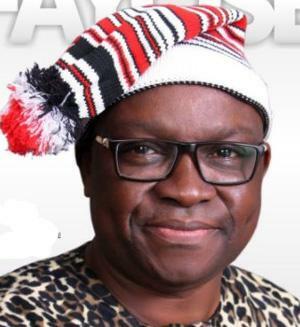 The post Fayose blames FG for turning yuletide to gloom period appeared first on Vanguard News.